Over the past couple years, Gov. Scott Walker has said repeatedly that something like the state’s deal with Foxconn doesn’t come around very often. His proclamation of the deal as a "once-in-a-lifetime" opportunity for the state rang out in a number of public speeches in 2017, from his weekly radio address to the splashy White House roll-out of the deal. But Foxconn’s status as a "once-in-a-lifetime" deal didn’t last very long. It was only about six months later that the governor decided to pull out the Foxconn playbook in an attempt to keep consumer products company Kimberly-Clark Corp. from closing two plants in Wisconsin. 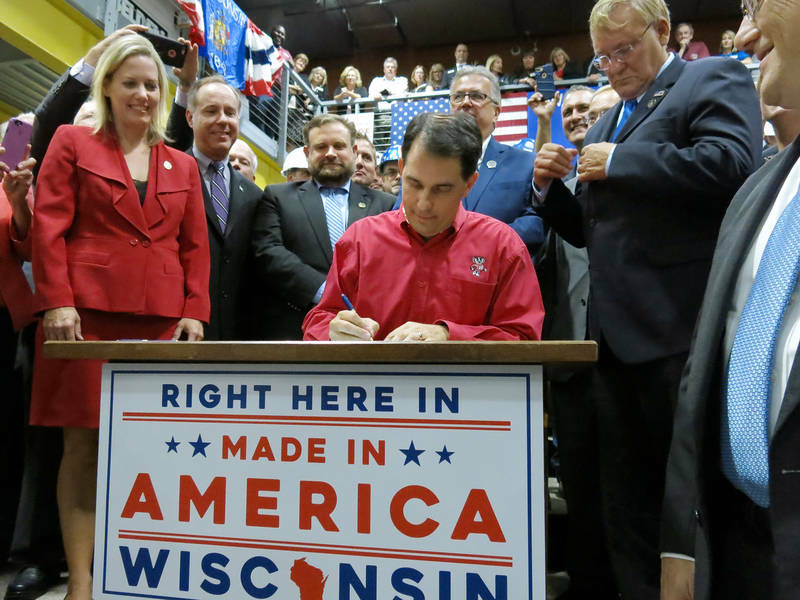 Speaking with reporters shortly after proposing the deal, Walker insisted "Foxconn-style" deals wouldn’t become his go-to economic strategy in the future, despite what it may look like. Kimberly-Clark, he said, is special. Like Foxconn. "This is a large industry that has a multiple ripple effect out there," Walker said. "I think in this case, when something has such a large impact, we’re willing to put a significant offer on the table." Walker said Kimberly-Clark and Foxconn are both "transformational" and provide jobs at numerous suppliers throughout the state, aside from the direct jobs created at their facilities. "This is a large industry that has a multiple ripple effect out there. I think in this case, when something has such a large impact, we’re willing to put a significant offer on the table," Gov. Scott Walker said. But Dr. Timothy Bartik, a senior economist at the W.E. Upjohn Institute for Employment Research, said the governor might have trouble being as selective as he wants to be with incentive deals in the future, now that he’s set a precedent. Bartik said incentives "are like potato chips." "When it comes to incentives, you can’t hand out just one," he said. Michael J. Hicks, director of the Center for Business and Economic Research at Ball State University, agreed. "Once a firm understands what your price is, how much Wisconsin policymakers are willing to pay for a new job, (they ask) 'Why can’t they get part of that deal?'" said Hicks. He called it "the Foxconn precedent." Bartik and Hicks have both studied tax incentive packages all over the country. Bartik said Foxconn got 10 times the incentives businesses usually get. "Essentially, with Foxconn, they kind of threw out all the old rules," Bartik said of the $4.5 billion deal. "Foxconn is an outlier in not just the size of the deal or the size of the promised incentive, but also the dollars per job that are promised," Hicks said. Both economists argued Wisconsin doesn’t have enough money to keep handing out deals like the one offered to and accepted by Foxconn. They said the state needs to be very picky about who qualifies for incentives in the future. "When it comes to incentives, you can’t hand out just one," said Timothy Bartik, a senior economist at the W.E. Upjohn Institute for Employment Research. Walker argues he’s applying that discretion. He points out Bonton, which had corporate offices in Milwaukee, announced in April plans to close stores and cut thousands of jobs in Wisconsin. In that situation, state government did not step in. While the governor continues to tout the incentive packages, his Democratic opponent in this fall's election, state Superintendent of Public Instruction Tony Evers, argues Walker is taking the state down a slippery slope. Evers argues Walker’s proposals have hinged too much on politics, not sound economic development principles. "We are going to move away from the idea that we need to somehow throw a Hail Mary pass every four years in order to make the economy grow in the state of Wisconsin," Evers told reporters after his annual State of Education address. Evers wants to eliminate the Wisconsin Economic Development Corp., which approved the state’s contract with Foxconn. He also said he wants to do more to keep state money in local communities by setting up loan programs for small businesses and start-ups. "Economic development in the state of Wisconsin should be a 72-county solution, not southeast Wisconsin versus the rest of the state," he said. However, Evers won’t commit one way or another to the Kimberly-Clark deal. He said he needs more details before he can judge the proposal, but voiced the familiar concern that offering more "Foxconn-style" deals could set a bad precedent for the state. "It certainly gives us pause … if it’s Kimberly-Clark, then it’s somebody else and somebody else," he said. "Economic development in the state of Wisconsin should be a 72-county solution, not southeast Wisconsin versus the rest of the state," said state Schools Superintendent and Democratic gubernatorial candidate Tony Evers. Evers said incentive deals like Foxconn and Kimberly-Clark can give the government too much power to pick "winners and losers" in business. Walker counters that his proposals are evidence he'll do whatever it takes when it comes to preserving and generating jobs in Wisconsin. Whether future companies get the same treatment could hinge on who's governor for the next four years — leaving voters to choose who they think will give them the biggest bang for their buck.